Some of our Cobaya events come together on the fly: a chef says they want to do one, we find a spot, and before you know it, dinner is served. Others require more legwork. 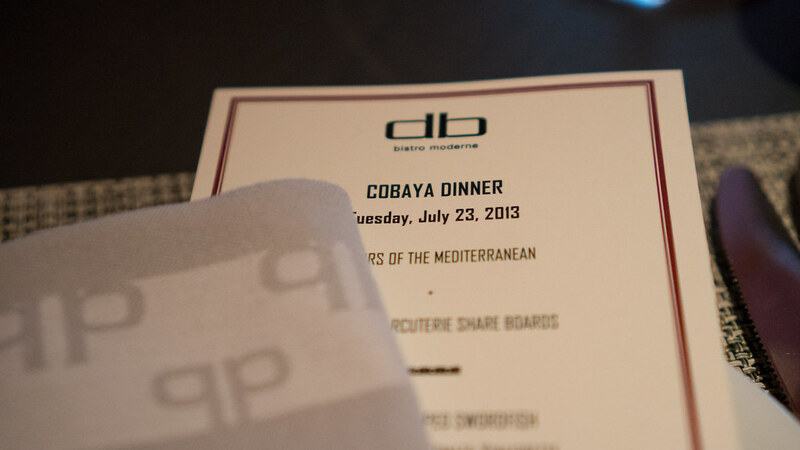 Our recent dinner at DB Bistro Moderne in downtown Miami fell into the latter category, with Chowfather in particular working for months to make it happen. The reality is, Daniel Boulud is not just a chef - he's a brand - and DB Bistro is not just a restaurant - it's an outpost of a culinary empire, with fourteen venues spread out among eight different cities in five countries. 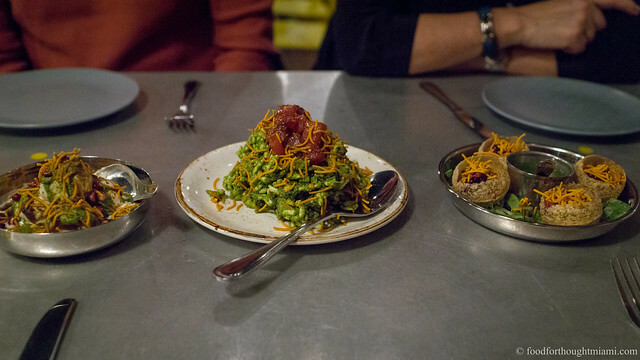 It's a little different from our usual modus operandi, but it was also a chance to do a dinner at what I regard as one of Miami's top restaurants. Other than maybe Michelle Bernstein at Michy's, or Kevin Cory at Naoe (really a different beast entirely), I don't think there's another kitchen in town that executes with such consistent precision. So we pushed forward, as I knew it would be a good meal, and wanted to see what executive chef Matthieu Godard (who took over the helm for Jarrod Verbiak about a year ago) would do given the Cobaya format (which is really nothing more than "cook whatever you want that gets you really excited and that you don't regularly get to do"). 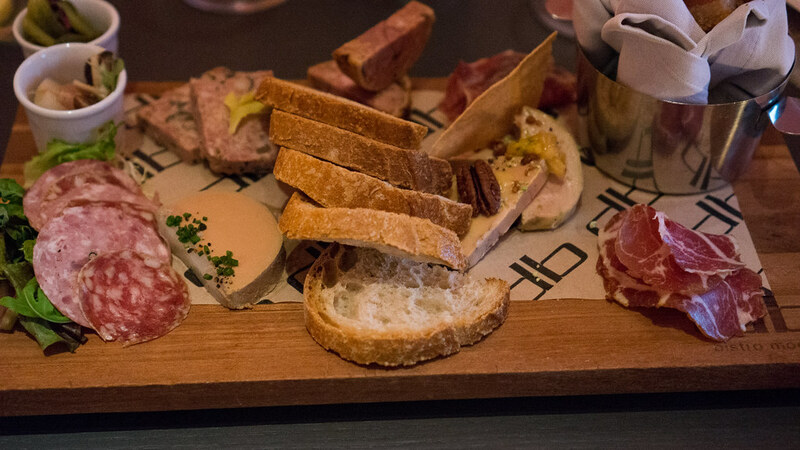 I've said before that I think DB's charcuterie is the best that can be found in Miami - and, indeed, some of the best I've had anywhere. So I was happy to see the dinner start with a board of it: a couple different salumi, a few different pâtés, ruby-hued slices of cured ham, a half-moon of lush, silky foie grass mousse, an assortment of pickled cornichons and onions, and maybe the showstopper of the platter, crackling-crisp nuggets of pork rillons, like croutons of pure pork belly. Soon another platter landed on the table, described as "Flavors of the Mediterranean." It was loaded with spanikopita, lamb kibbe, mussels in a spicy tomato sauce, mackerel escabeche, slices of chorizo and manchego cheese, a little "fritto misto" of smelts and calamari, marinated olives and marcona almonds, and ramekins of roasted eggplant baba ghanoush, red pepper hummus and tzatziki. 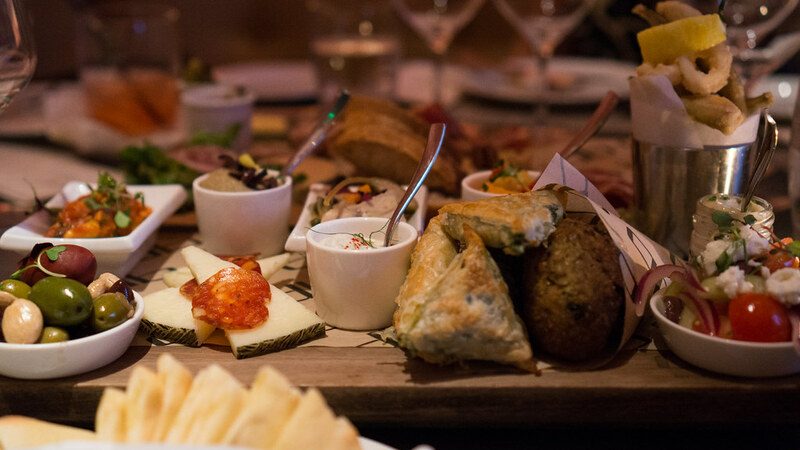 Aside from offering such a copious selection of treats, the communal presentation of these first courses on the boards was a nice ice-breaker. We always have a mix of newcomers and veteran guinea pigs at these dinners, and this was a good way to get strangers passing dishes around - and eventually, prompt some good-natured fighting over the last spanikopita. I'll confess, I didn't really understand The Dutch at first. Here was a French-trained chef with an Italian-sounding last name, with a menu that seemed like a hodge-podge of American comfort foods, but with things like kimchi and jerk chicken making random appearances - and it was called "The Dutch"? Andrew Carmellini is a protege of Daniel Boulud whose first big gig was as chef de cuisine at New York's Café Boulud. When he went out on his own, he made a name for himself with Italian restaurants, first A Voce and then Locanda Verde. But when he opened the Dutch in Soho in 2011, it was something different: oyster platters, steaks and chops shared space with smoked white fish chowder, rabbit pot pie and "barrio tripe." 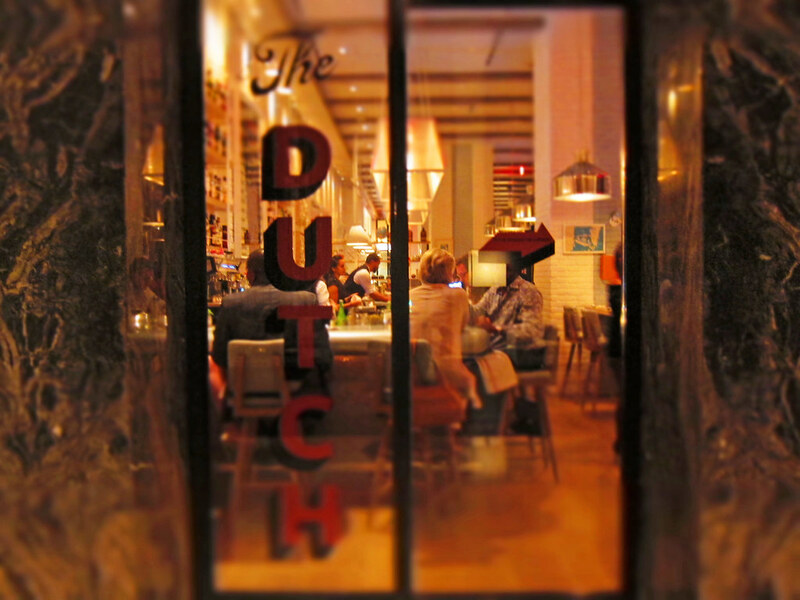 And when he brought a second iteration of the Dutch to Miami the next year, in the W Hotel South Beach, it had the same kind of eclectic mix, but with a South Florida twist - think ceviches of local fish and salted lime pie. After getting Carmellini's cookbook, "American Flavor," it started to make some more sense. From Southern style biscuits to pozole inspired by Puebla-born dishwashers to steak with the flavors of Flushing's Korean BBQ joints, the book is an extended love note to "American" food in all its traditional and modern polyglot guises. It is one that Carmellini seems simultaneously overqualified and underqualified to write - you might just as easily ask "Why is a chef who worked with Gray Kunz, Alain Passard, and Daniel Boulud wasting his time making fried chicken?" as "What does that fancy-pants chef possibly know about fried chicken?" The answer perhaps lies in something Albert Adrià was recently quoted as saying: "There are only two kinds of cuisine. Good and bad." Carmellini? He makes the good kind. After going there many times over the past year and a half since it opened, the Dutch strikes me as a sort of restaurant incarnation of "American Flavor." You can dine much as you might have a hundred years ago, getting a dozen freshly shucked oysters and a dry-aged, bone-in steak. Or you can get yellowtail crudo with spicy watermelon, followed by a pork chop "al pastor." Either way, you'll eat well. (You can see all my pictures in this The Dutch flickr set). 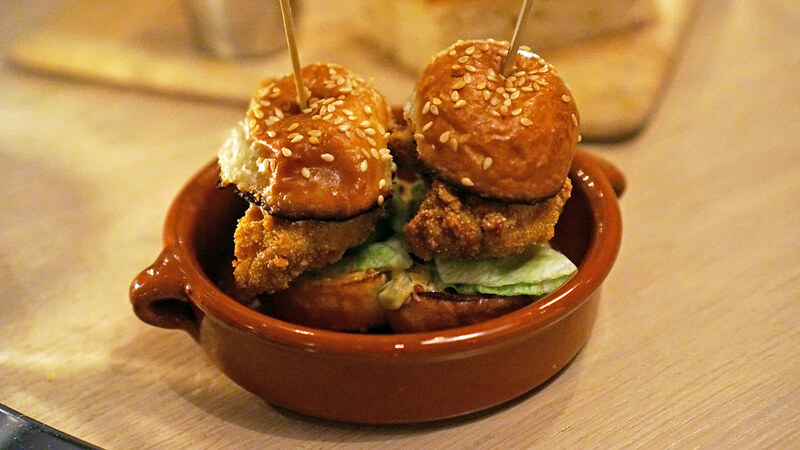 There is no better way to start a meal at the Dutch than with the "Little Oyster Sandwiches" that head up the "Snacks." The oysters are rolled in cornmeal with a dash of cayenne and pimentón, fried just enough to crisp the exterior without hammering them, then tucked into a soft sesame seed flecked brioche bun that's been smeared with a pickled okra tartar sauce, a sheet of iceberg lettuce providing some delicate cool crunch. It is a perfectly designed and crafted bite, showing a lot of attention paid to a small package.